So some of you may already know that we have the opportunity to spend another few months in Sicily. Things have been a little hectic leading up to this trip, so I find myself feeling a little less prepared than I usually am. Do we have a place to live? Not so much. Did I practice my Italian? Well no, unless somebody can figure out the strange Italo-Span-glish concoction I’ve got going on. Lo siento, signore, mi Italiano no muy… good. Grazie-as. Holy cow am I up a creek. My flights in were just fine, other than some really tight connections. In Atlanta, we landed at A2 and my flight to Rome was at F4… about as far away as you can possibly get in one of the world’s largest airports. I had about 45 minutes from landing to the other flight’s departure, so I had to run to make it. I got there with about six minutes to spare, where the gate agent complimented me on my speed. Most of our section laughed at that, though it was hard to tell if he was being facetious. I had just gotten off another flight in coach that — for coach — was pretty darn comfortable. What I can tell you is that, after nine hours most seats are probably uncomfortable, but I think Mr. Pilot was absolutely right. Airbus knows how to make a damn uncomfortable seat. But, I’ll still take it any day over coach. There were also some Magic Galley gems on this flight, too. Apparently, nobody had seen the caterer, so all the flight attendants were very concerned that there was no food, or that it was the wrong food, or not enough food. These concerns ended up being unfounded; all the food was there, and it was all quite tasty. But as it’s the magic galley – out of which no one can hear anything – the passengers around me were definitely not concerned about the fact that they hadn’t eaten in the airport because they planned on eating on their flight. We had quite a bit of turbulence (about three hours of it!) but they pressed on with meal service anyway. At one point it was so bad that the wine cart fell over in the forward galley with a loud crash and much breaking of glass, but surprisingly little profanity from the crew. The flight attendants proved to have the dropsies for most of the flight, so by the time we arrived in Rome, they were all pretty on edge. Arriving in Rome was a disaster, so in other words, totally normal. 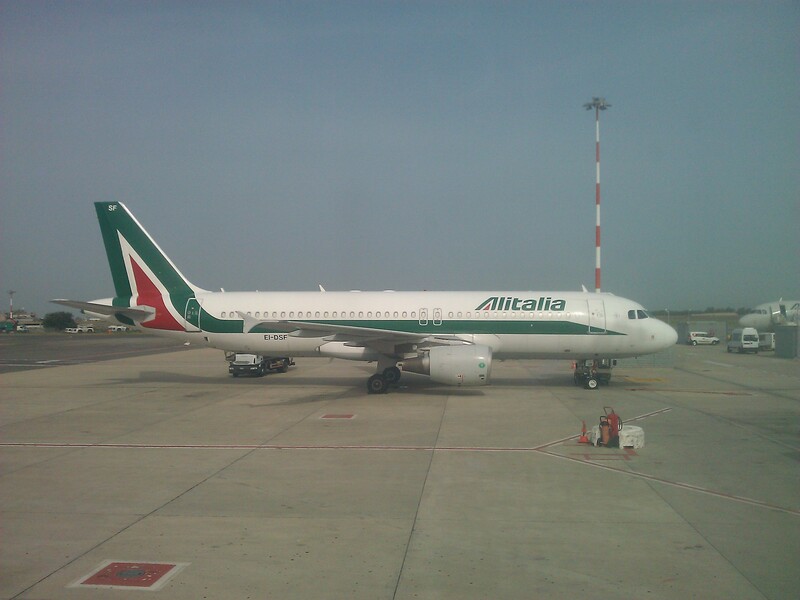 I only had an hour connection time, where I crowded around security at the domestic terminal, crowded around passport control, crowded around the ticket desk to get my Alitalia ticket, and crowded around the gate to miss my flight by 45 minutes. The airport was absolutely packed with people. I would have loved to run to each step in the process, but there were so many people, I had to wedge my way through. Note to self: minimum two hour connections here. Fortunately, I was able to get on the next flight with no problem. The flight to Catania was only half full, so I was able to relax a little. 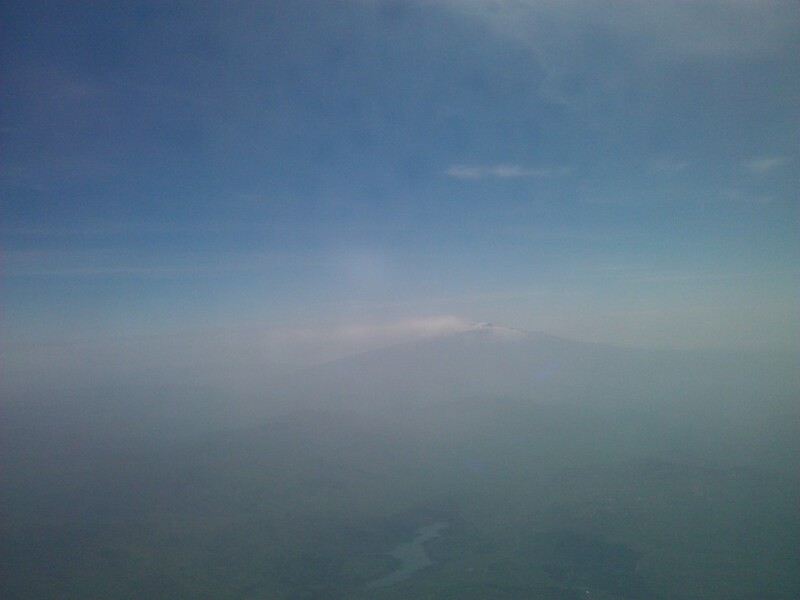 It was a bit of a hazy day, but our route around Etna was too good for me to not try for a picture or two. Pretend it’s a 3-D picture where you have to cross your eyes to see Mt. Etna.